Your comfort is our priority. Please let us know how we can make your visit more comfortable! 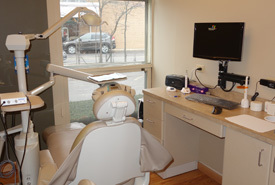 Dr. Baek also utilizes laser dentistry to make procedures more precise and more comfortable. According to Dr. Baek, this much-less invasive type of dentistry can be used to replace the scalpel and drill in some procedures. Cavities, for example, can be fixed very quickly, easily and painlessly. Laser dentistry can also be used for soft tissue procedures such as gum surgery. Some procedures may not require local anesthesia when performed with the lasers. Other advantages of laser dentistry include minimal bleeding and faster healing times.